[Marco Donnarumma] What is the human body for you, and how do you relate to it in your artistic practice? 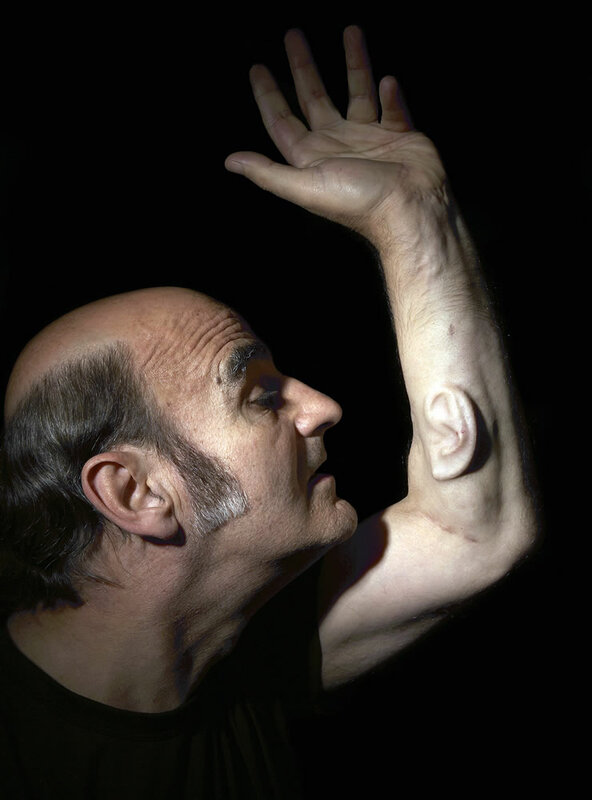 [Stelarc] The body is what allows this person to operate and become aware in the world. I’ve always been envious of dancers and gymnasts who use their bodies both as a medium of expression and also a means of experience. The body becomes a site of action, interaction and experimentation. Using this particular body means bypassing ethical issues that some of the projects and performances would generate, if they were performed on other bodies. And of course there is the realization that we are no longer merely biological bodies. Rather, the body has become a chimera, a combination of meat, metal and code. The body has become a hybrid and extended operational system, performing beyond the boundaries of its skin and beyond the local space that it inhabits. 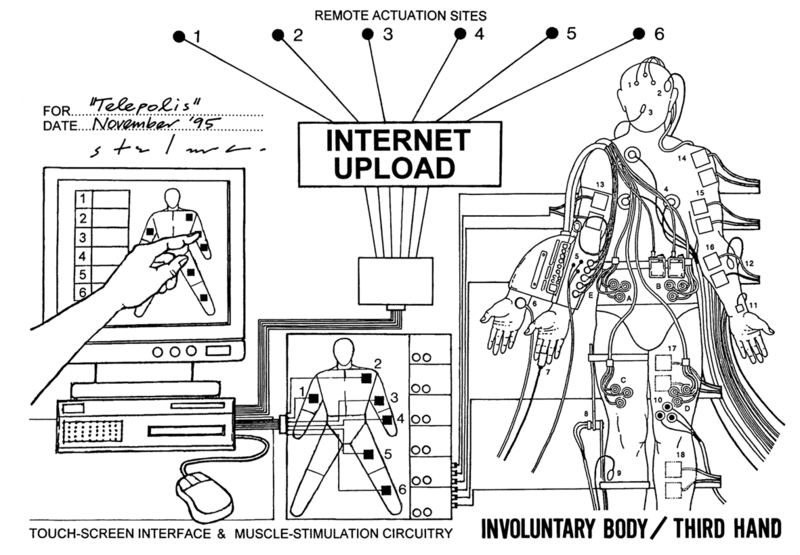 We can project our physical presence and perform remotely with bodies and machines. 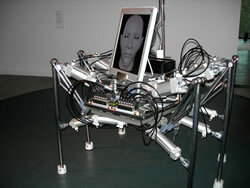 Fractal Flesh is the idea of a multiplicity of bodies and bits of bodies, spatially separated but electronically connected, generating recurring patterns of interactive actions at varying scales. We are now expected to perform in Mixed and Augmented Realities, to seamlessly slip between the actual and the virtual. Actualizing interfaces between bodies, machines and virtual task environments, directly experiencing them and thereby being able to articulate something meaningful, has been what these performances and projects have all been about. Several of your works depends on the physiological state of your body to drive the generation and playback of sounds and music. I think of the Third Hand, the Extended Arm, Exoskeleton or the Muscle Machine, for instance. In which ways do you think of and deploy biological signals in your performance works? The Amplified Body performances begin in 1971 and continue till the late 1980s. EEG (brainwaves), EMG (muscles), ECG (heartbeat) and Ultrasound (blood-flow) were used. I also amplified stomach sounds. 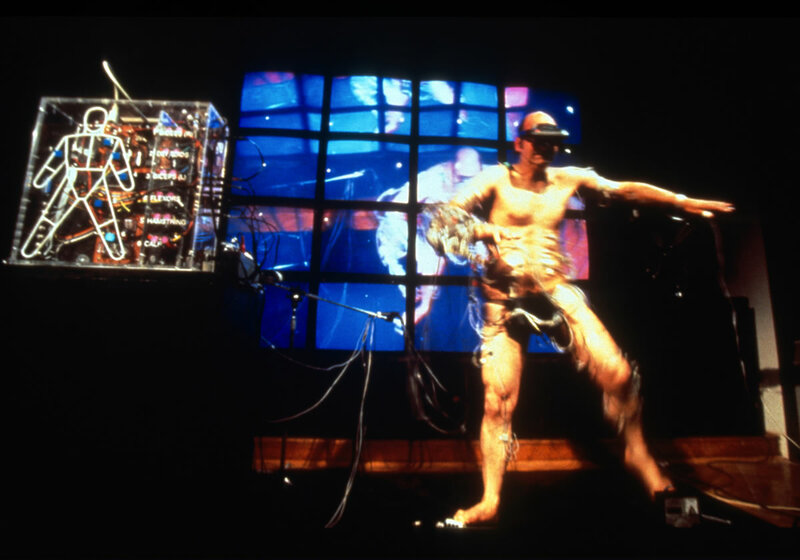 The performances began when the body was switched on and were completed when the body was switched off. The cacophony of sound was altered both by physiological control and also through the fatigue of the body over the duration of the performance. For example, adjusting attention altered brainwave frequency and slowing down breathing affected heartbeat. Constricting the radial artery of the wrist changed the ultrasound measure of blood-flow. Several kinds of ultrasound sensors were used. The flat type sensor was fixed to the wrist for shallow monitoring of blood-flow. The handheld pencil-type sensor was used for amplifying deeper heart activity, like the heart valves opening and closing and the sloshing of the blood through them. The earlier suspension performances with harness were amplified. And some of the suspensions with hooks into the skin amplified body signals, registering the physical tension of the stretched skin. But most of the amplified body events were with the Third Hand. The Third Hand was an EMG-controlled mechanism, using the abdominal and thigh muscles, allowing independent movement of the three hands. It had a tactile feedback system, providing a rudimentary sense of touch. 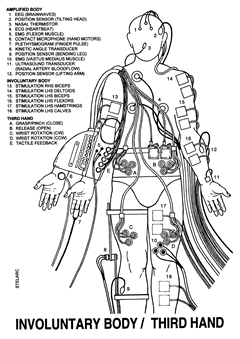 The mechanical hand’s operation was amplified with contact microphones and the sound was sampled and looped with a digital delay, generating rhythms that counterpointed or synchronized with the heartbeat, for example. With the Extended Arm, Exoskeleton and the Muscle Machine, which were more industrial machines, delicate body sensors and electrodes were not suitable for control and choreography. For those encoders, electro-magnetic, flexion, proximity and accelerometer sensors were employed. Your career is incredibly productive and long standing. From the 70s up to now the way we all relate to technologies has drastically changed. How your audience has changed? How do you think the expectations and feedback of today’s audience are different from the ones of 30 years ago? Certainly there are both artistic and audience issues with the transition between wired and wireless devices. The æsthetic change has been pronounced. There was often a visually discernible connection between the performer and the equipment. With wireless systems not only are there no more wires, but also the transmitters are becoming smaller and are no longer visible. In fact with the University of Illinois’ “epidermal electronics”, circuits can be directly stuck onto the skin. With vision systems that analyze the artist’s body posture or limb gestures as a control means, the audience is faced with interpreting arbitrary motions and imagining what they are controlling. There has never been a focus nor concern for an audience. None of these projects and performances are designed with certain audience expectations. Some performances were done with no one there other than the assistants who helped realize it. Sometimes there was an audience but they were remotely located or sometimes in-world for the Second Life performances. On the other hand, in Copenhagen the street audience for the City Suspension was in the tens of thousands. Undeniably, there is an increasingly larger audience for interactive installations and performances that is a more educated one for electronic arts. Although what is sometimes irritating is the audience expectation that any installation is interactive and that somehow the individual should be a participant in the artistic outcome. My performances come from a visual arts education. So often they’re framed as installations that possess not only space and duration but also sound qualities. I’ve always seen sound as sculptural. Sound as varying compressions of air. Not simply and elegantly entering the ear but colliding with vibrating skin and bone. 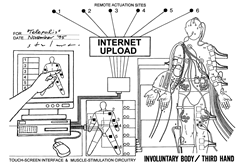 Sensor systems coupled with computers have reanimated musicians to generate sounds with gestures and limb motions. Velocity, proximity, pressure, flexion signals can be registered acoustically. 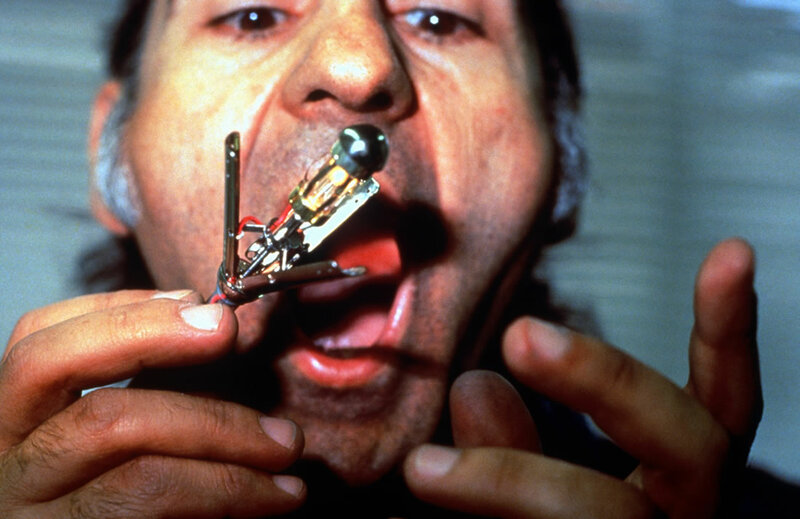 Certainly there are more possibilities to explore sonically with body signals. I certainly admire these artists, whose work incorporates the technically seductive (Suguru Goto’s Augmented Body and Virtual Body), visually and acoustically elegant (Terminalbeach’s The Heart Chamber Orchestra) to the physically spectacular (the Sensorband SoundNET performance). Being musicians, there is a sense of timing and structure. With my Amplified Body performances, similarly with you, I imagined the body as a self-contained source of sounds. When I first started performing, I wanted to use sound and amplifying this body was the most relevant and robust approach to take. During a performance your body is often addressed as an object, rather than a subject. However, for a performer the subjective perception of sound and movement, and the cognitive processes by which one can deliver a satisfying performance are crucial. How do you position your performative strategies in this context? The body is seen not as a site for the psyche nor for social inscription but rather as a sculpture. Not as an object of desire but an object for possible redesign. What’s interesting for this artist is examining the body as an evolutionary architecture and experimenting with alternate anatomies. These performances are certainly structured but they are not scripted. The body performs with indifference (as opposed to expectation). The performance is not agency driven. The outcome is systemic rather than subjective. The performance unfolds with its own time and with its own rhythm. If the body is obsolete, is it only our mind that makes us human? Well, what makes us human is not merely our physical bodies but our social institutions, our political structures, our cultural conditioning and our technologies that effectively become our external organs. Speaking about a “mind” is problematic in a Platonic, Cartesian or Freudian sense. The more and more performances I do, the less and less I think I have a mind of my own, or any mind at all in the traditional, metaphysical sense. Asserting that we “possess” a mind generates an unnecessary retro recursiveness of logic. Rather our evolutionary architecture generates our operation and awareness of the world. There is no “I” in the way we generally imagine. There is only a body that interacts with other bodies, situated in history. The “I” is a language construct that compresses a more complex interactive situation. What is important is not what’s “in” you or me but rather what happens between us, in the medium of language within which we communicate, in the social institutions within which we operate, in the culture that we’ve been conditioned by - at this point in time in our history. So this is not an essentialist model of the human but one that allows for a more flexible and fluid unfolding and definition of the human condition. It’s more in the realm of a Deleuzian becoming. And what constructs our identity is no longer our physical presence nor location but rather our connectivity. To be curious and creative is to be human. And perhaps what it means to be human is not to remain human at all. 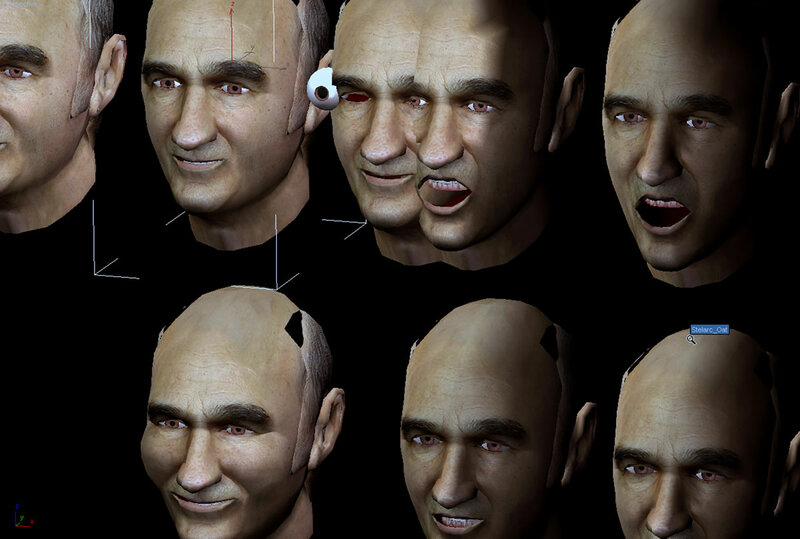 What is the Prosthetic Head project and how has it been used musically? The Prosthetic Head is an embodied conversational agent that speaks to the person who interrogates it. It resulted in other outcomes like the Walking Head (an autonomous and interactive pneumatically actuated 6-legged walking robot with a human head displayed on its LCD monitor) and the Partial Head (a tissue engineered hominid-human construct). As an installation, the Prosthetic Head is projected as a 5-metre high head. It has a database and conversational strategy that, when coupled to a human head, offers the possibility of interesting verbal exchanges. It can also creatively generate its own poetry-like verse and its own song-like sounds, which are different each time you ask it to sing. Last year the Prosthetic Head performed with a vocalist (Lore Lixenberg) and percussionist (Christos Michalakos) for the BEAM Festival at Brunel University. There have been several CDs released, the Humanoid and Humanoid: Fractal Remix, with musicians Rainer Linz and Christopher Coe. With the second CD, and in collaboration with mathematician Cameron Jones, fractal shapes were printed directly on the surface of the CD. Depending on the kind of shape, its colour and position resulted in a remixing of the tracks which is different played on an CD player, a PC or Mac OS system. As part of the Thinking Head research led by the MARCS Auditory Labs at the University of Western Sydney, robot embodiments of the Head were realized with the Articulated Head and the Swarming Heads. A performance done at the Powerhouse Museum last year titled “Spinning / Screaming: Event for Amplified Head” used a Kinect sensor interface to allow the artist to actuate and animate the Prosthetic Head through gestures. There was a choreography of spinning and singing. Recently you underwent an operation to embed an ear on your arm. Where do you wish to go from there? The correct way to describe the Ear on Arm is that an ear is being surgically constructed and cell-grown on my arm. There have been several surgeries so far. But it’s still only a relief of an ear. We need to surgically lift the helix to construct an ear flap and it’s been confirmed that this year we will grow a soft ear lobe using my extracted adult stem cells. Only when the ear is a more 3D structure will the small microphone be reinserted into the ear construct, that connected to a wireless transmitter will internet enable the ear. So if you are in London and I am in Melbourne you’ll be able to listen in to what is going on. What’s happened is that a body structure has been replicated, relocated and sometime soon will be rewired for additional capabilities. The project began as an idea in 1996. It took ten years to find funding and to get three surgeons to assist. It’ll probably take another five years to fully realize it. The Internet Ear project was an online installation done for Biotopia: Art in the Wet Zone (2010–11). Life-size soft casts were made of the Ear on Arm with implanted microphones, located in Aalborg, Moscow and Paris. The voice-recognition system tries to understand what you’ve said and then speaks it in all of the locations simultaneously. If you cannot be physically there, you could go online, click on the ear and leave a message which the text-to-speech system speaks into the three locations. The result was a cacophony of reverberating sounds made more poetic by the feedback in the system and the slippage of meaning that was generated. Can you tell us something about your future artistic research? There are several new projects that have already been initiated. A Microbot is being engineered small enough and robust enough to climb up my tongue and into my mouth. A webcam and LED will be mounted on its chassis. This performance will be streamed live and is likely to happen before the end of this year. The Haptic Head installation will be between two separate locations. Touching, twisting and turning the large head in San Francisco will be felt with force-feedback by the artist’s head in Melbourne. 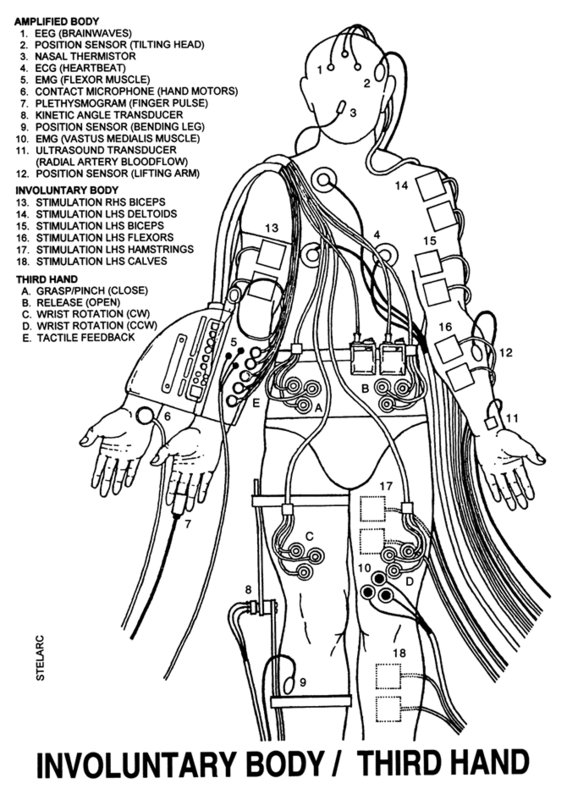 A pneumatic array of pads will be actuated to translate the remote caress. 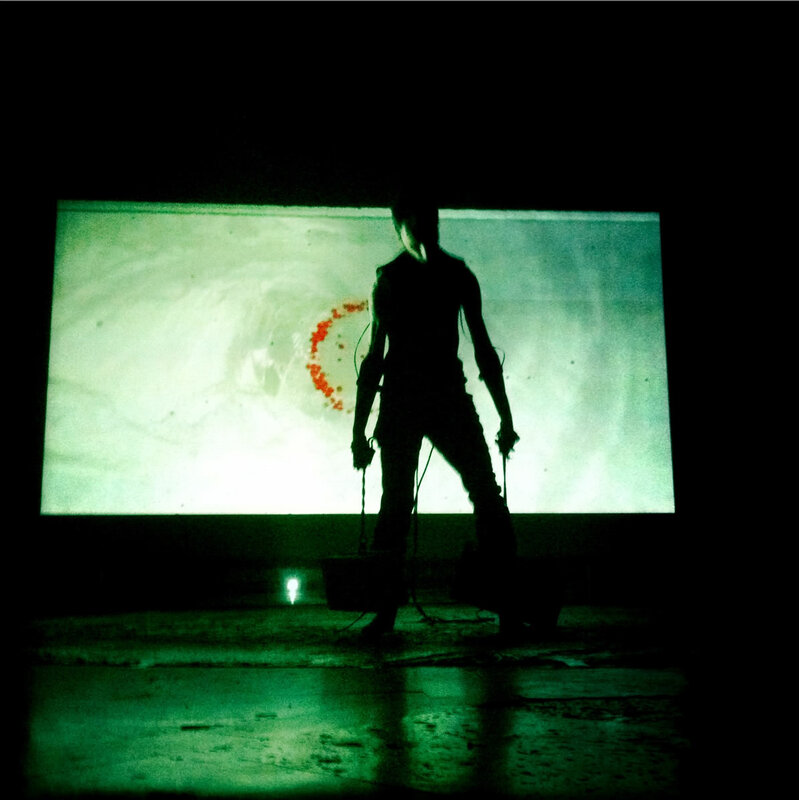 The choreography of what is felt with force-feedback will be registered with sound. And another installation and performance that will happen next year but only with adequate funding, is Second Skin. This is a collaboration with another artist, Antero Kare from Helsinki. The idea is to grow a layer of microbial skin over the body in a specially designed incubator. The glass cuboid has to be engineered as a life support system for both the body and the microbes. Humidity and temperature need monitoring. An array of nozzles will intermittently mist the skin. The microbes will be chosen for their robustness and fast growth and for their interesting architectures. The pumping and spraying will be amplified so the performance will be driven by this intermittent and rhythmic activity of sound. This will also be accompanied by the more ambient sounds resulting from a visual analysis of the second skin. So the presence of the visual installation will be augmented and extended by the acoustical landscape of microbial growth. 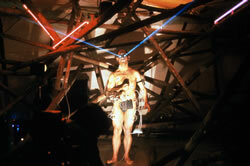 Extensive documentation of much of Stelarc’s work is available under the “Activities / Projects” category on his website.